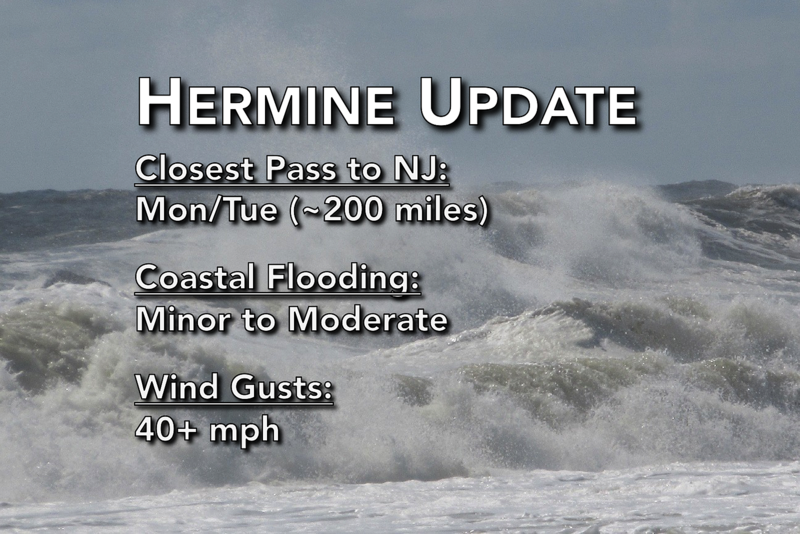 Expect minor to moderate coastal flooding, gusty winds, and possibly a few raindrops as Hermine makes its closest pass to the Garden State. Well, New Jersey will feel the "wrath" of Post-Tropical Cyclone Hermine on this Labor Day Monday. But even as the storm's center makes its closest pass to the Jersey Shore - about 200 miles away - those impacts won't be nearly as severe and devastating as once thought. As of 8 a.m. Monday, the National Hurricane Center maintained Hermine's maximum sustained winds at 70 mph. The storm is now moving north at a very slow pace, 3 mph. Such a track, temporarily turning back toward the coast, has been anticipated and is not cause for alarm. Model consensus shows Hermine pushing out to sea on Wednesday and out of our hair. There are a couple of models (most notably, the NAM) that suggest a closer pass to Long Island, but I'm ready to write them off as outliers at this time. Early Monday morning, the Tropical Storm Warning was dropped for all of New Jersey. A warning is still in effect for the ocean waters just off-shore. And a Coastal Flood Advisory and Beach Hazards Statement have been issued to cover the impending higher-than-usual high tides, strong rip currents, and beach erosion. Yes, tidal waterways will be running high Monday and Tuesday. Thanks to Hermine's jog further out-to-sea over the weekend, "record" or "near-record" flooding is thankfully off the table. 1 to 2 feet of storm surge will push tidal waterways along New Jersey's south coast to the bottom edge of the moderate flooding category. The worst flooding is now expected to occur at the Monday evening (~11 p.m.) and Tuesday morning (~11 a.m.) high tides. Such flood levels may necessitate road closures. Low-lying areas along tidal waterways may experience some degree of water inundation. In addition, large 9 to 14 foot waves will continue to batter New Jersey's beaches through midweek. More severe erosion will occur as sand is lost to the mighty Atlantic. I doubt New Jersey's weather will be as pleasant on Monday as it was on Sunday, especially as the wind kicks up again. Sustained winds are expected to reach the 15 to 25 mph range, with gusts to 40 mph. As you might guess, the wind will be strongest along the coast. Tuesday looks windy too. As for rain, it's still expected to be minimal. I'm not going to rule out a few bands of showers from making it to New Jersey on Monday and Tuesday. But models are showing meager rainfall totals on the order of 0.10" or less. So what's up next in the wild world of New Jersey weather? As Hermine departs, temperatures will quickly warm back into the 80s for Tuesday and Wednesday, and possibly into the lower 90s by Thursday. Humidity will build back too - not to oppressive levels, but enough to be noticeable. It's a pretty dry forecast, with our next widespread rain chance associated with a cold front passage around Sunday-Monday. Unless the forecast changes significantly, this will be my final update on Hermine. And my final blog of the week, as I (finally) take some time off for some much-needed rest, relaxation, and family time. In my absence, you'll be in the extremely capable hands of my weather and news team colleagues.